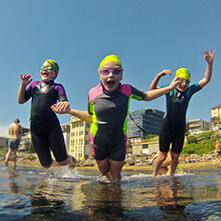 The GoPro is the go-to camera for action sports, and is very popular with ocean swimmers. I’ve been filming with a GoPro for years, using them in OceanFit lessons and socially. Any time you use a camera in the ocean environment you’re up against it – it can be hit and miss at the best of times, even with the very best equipment. I’m often asked for tips on taking photos in the ocean using a GoPro, so here are my top tips for protecting your camera, minimising fogging, and reducing water spots. Don’t trust the GoPro camera housing alone in the ocean – the salt and waves will kill it. I believe there’s no such thing as a waterproof camera, so get yourself a Super Suit. Make sure the inside of the Super Suit is completely dry before putting the GoPro inside. There can’t be one bit of moisture as this will increase the chances of the suit fogging up. Use Anti Fog Inserts if you’re trying to capture one-off experiences/events as they’ll reduce the chances of fogging (they are single-use, so I don’t use them at times where it doesn’t really matter if I capture images or not). Don’t leave your GoPro in direct sunlight at any stage before going into the water, this speeds up the fogging of any moisture in the suit. When in the water, keep the camera under the water as much as possible to keep it cool and also reduce the chance of fogging. To avoid water spots on the lens, before taking specific photos, simply wipe the suit in front of the lens with your finger. Check the lens just before you take the photo (you should also be able to look at the screen – you’ll need to have the brightness turned up on the screen to be able to see in bright light, but be mindful that this will also make the battery drain faster). Sometimes I will dip the camera under the water before taking a photo because it puts a water gloss over the whole lens, which is better than a drop of water. You can also lick the camera lens area, or spit on it. There are also some commercial products you can use, although I haven’t used them.